This is a delicious fruit and nut scone that melts in your mouth. Filled with currant and nuts, the texture in this scone will make you come back for more. 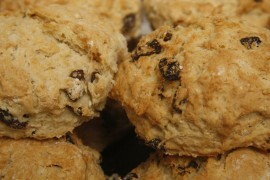 Remember to store scones in a container after 30 minutes of cooling to preserve the moisture. Set the oven to 400oF. Grease a cookie sheet. Blend the baking powder, salt, and flour in a separate bowl. Cream the butter with the sugar in the mixer. Gradually add in the beaten egg, vanilla, milk and beat on high. Add in the flour and mix it into the batter on low till it forms a stiff dough. Drop it on the cookie sheet with an ice cream scoop, and bake it in the oven for 18- 20 mins. Cool for 30 minutes on a cooling rack and store it in a container for up to a week. Ingredient statement: Flour, sugar, butter, driend currants, milk, walnuts, eggs, baking powder, vanilla extract, salt.